I`m from Norway. During my early years, my grandfather Nicolai told me about his sightings of the "winter-comet" in 1910 (not Halleys) as a kid, and showed me pictures of celestial objects in books and magazines. This really got me interested in the science of nature, and I later educated myself as a geologist. For many years my interest in astronomy became a "read only" hobby. Then, in september 2000, I attended a cource in "practical astronomy" by Sogndal Folkehogskule (one-year collage). 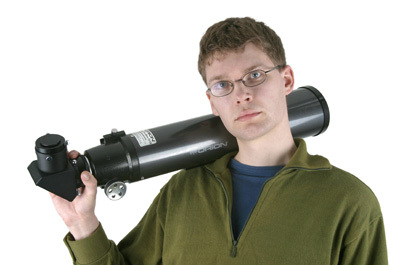 Later that autum I bought my first telescope, a small 114mm reflector on a equatorial mount. Since I`ve photographed for many years, astrophotography became my main challenge. Using ordinary negative film, I slowly got more experience and knowledge of this field. I realized that you have to do a lot of experimenting, and often crafting/tuning your telescopic/photographic equipment in order to get the result you desire. A couple of years later I bought a dedicated photographic telescope and equatorial mount, a Vixen R200SS and Losmandy GM-8. Combined with a digital SLR (Canon D60), I quickly got better results. The D60 is now upgraded to a 20D, a digital SLR with significant less electronical noise than the D60. As a travel/guidingscope, I use the Orion 80mm ED f/7.5. Excellent optics, cheep price and a nice performance on both planets and deep-sky objects. I also use a Televue 4" Apo for photography and observing. These instruments are placed in a 7.6 squaremeter observatory with a roll-off-roof. Hope you will enjoy my homesite, I`m using it to share my pictures and experiences with people all over the world. I´ve also started doing webcasts during major events like noctilucent clouds, auroras, solar eclipses and lunar eclipses. People from all over the world have visited my webcasts, and many of you have also mailed me later. Thanks! My webcast can be seen at this site.